SMU faculty and students, the University’s Shuler Museum of Paleontology, and the SMU Innovation Gymnasium have teamed with the nation’s new premier museum of nature and science to provide everything from dinosaurs and sea turtles to technical assistance and advice. Fossils on loan by SMU to Dallas’s new Perot Museum of Nature and Science include those of animals from an ancient sea that once covered Dallas. The fossils represent a slice of SMU’s scientific collaboration with the Perot Museum and its predecessor, the Dallas Museum of Natural History. 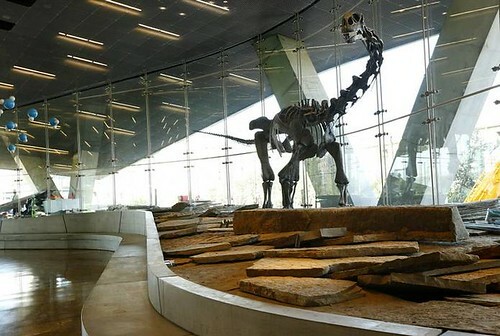 Items from SMU’s scientists include a 35-foot skeletal cast of the African dinosaur Malawisaurus (pictured above) standing sentry in the spacious glass lobby of the Perot, which opened Dec. 1 near downtown Dallas. “The new museum building itself is an icon, but it’s also a statement by the city about taking the advances of science to the public,” said vertebrate paleontologist Louis Jacobs, an SMU earth sciences professor, who serves on the Perot Museum’s advisory board and Collections Committee. Jacobs, who was ad interim director of the Dallas Museum of Natural History in 1999, led the team that discovered Malawisaurus in Africa. He provided the cast to the museum. Fossils on loan are from the Shuler Museum collection in the Roy M. Huffington Department of Earth Sciences. SMU scientists provided technical expertise for exhibits and serve on the Perot Museum’s advisory committees. Also on exhibit from SMU is a miniature unmanned autonomous helicopter designed for fighting fires that was built by students in SMU’s Lyle School of Engineering. Shuler Museum fossils can be viewed in the T. Boone Pickens Life Then and Now Hall. They include an unnamed 113 million-year-old herbivorous dinosaur discovered in 1985 at Proctor Lake southwest of Stephenville, Texas. For perspective on that exhibit’s paleoenvironment in Texas at the time, SMU paleobotanist Bonnie Jacobs provided fossil wood, fossil cones, fossil leaves and images of microscopic pollen grains from the Shuler Museum. The fossils provided information used to create a model of an extinct tree to accompany the exhibit. In the late 1800s, a flurry of fossil speculation across the American West escalated into a high-profile national feud called the Bone Wars. Drawn into the spectacle were two scientists from the Lone Star State: geologist Robert T. Hill, now acclaimed as the Father of Texas Geology, and naturalist Jacob Boll, who made many of the state’s earliest fossil discoveries. Hill and Boll had supporting roles in the Bone Wars through their work for one of the feud’s antagonists, Edward Drinker Cope, according to a new study by SMU’s Louis Jacobs, a vertebrate paleontologist in the Huffington Department of Earth Sciences, Dedman College. The study by Jacobs expands knowledge about Cope’s work with Hill and Boll. It also unveils new details about the Bone Wars in Texas that Jacobs deciphered from 13 letters written by Cope to Hill. Jacobs discovered the letters in an archive of Hill’s papers at SMU’s DeGolyer Library. The letters span seven years, from 1887 to 1894. Hill, who worked for the U.S. Geological Survey, not only provided Cope with fossils of interest but also shared geological information about fossil locales. Boll, who was a paid collector for Cope — as was the practice at the time — supplied the well-known paleontologist with many fossils from Texas. More than 30 of the taxa ultimately named by Cope were fossils collected by Boll. “Fossils collected by Boll and studied by Cope have become some of the most significant icons in paleontology,” said Jacobs, president of SMU’s Institute for the Study of Earth and Man. His study, “Jacob Boll, Robert T. Hill, and the Early History of Vertebrate Paleontology in Texas,” is published in the journal Historical Biology as part of the conference volume of the 12th International Symposium on Early Vertebrates/Lower Vertebrates. Jacobs describes the late 1800s as a period of intense fossil collecting. The Bone Wars were financed and driven by Cope and his archenemy, Othniel Charles Marsh. The two were giants of paleontology whose public feud brought the discovery of dinosaur fossils to the forefront of the American psyche. Over the course of nearly three decades, however, their competition evolved into a costly, self-destructive, vicious all-out war to see who could outdo the other. Despite their aggressive and sometimes unethical tactics to outwit one another and steal each other’s hired collectors, Cope and Marsh made major contributions to the field of paleontology, Jacobs said. Portable laser scanning technology allows researchers to tote their latest fossil discovery from the field to the lab in the form of lightweight digital data stored on a laptop. But sharing that data as a 3D model with others requires standard formats that are currently lacking, say SMU paleontologists. University researchers used portable laser scanning technology to capture field data of a huge 110 million-year-old Texas dinosaur track and then create to scale an exact 3D facsimile. They share their protocol and findings with the public – as well as their downloadable 145-megabyte model – in the online scientific journal Palaeontologia Electronica. The model duplicates an actual dinosaur footprint fossil that is slowly being destroyed by weathering because it’s on permanent outdoor display, says SMU paleontologist Thomas L. Adams, lead author of the scientific article. The researchers describe in the paper how they created the digital model and discuss the implications for digital archiving and preservation. Click here for the download link. “This paper demonstrates the feasibility of using portable 3D laser scanners to capture field data and create high-resolution, interactive 3D models of at-risk natural history resources,” write the authors. “3D digitizing technology provides a high-fidelity, low-cost means of producing facsimiles that can be used in a variety of ways,” they say, adding that the data can be stored in online museums for distribution to researchers, educators and the public. SMU paleontologist Louis L. Jacobs is one of the coauthors on the article. “The protocol for distance scanning presented in this paper is a roadmap for establishing a virtual museum of fossil specimens from inaccessible corners across the globe,” Jacobs said. Laser scanning is superior to other methods commonly used to create a model because the procedure is noninvasive and doesn’t harm the original fossil, the authors say. Traditional molding and casting procedures, such as rubber or silicon molds, can damage specimens. But the paleontologists call for development of standard formats to help ensure data accessibility. “Currently there is no single 3D format that is universally portable and accepted by all software manufacturers and researchers,” the authors write. SMU’s digital model archives a fossil that is significant within the scientific world as a type specimen – one in which the original fossil description is used to identify future specimens. The fossil also has cultural importance in Texas. The track is a favorite from well-known, fossil-rich Dinosaur Valley State Park, where the iconic footprint draws tourists. The footprint was left by a large three-toed, bipedal, meat-eating dinosaur, most likely the theropod Acrocanthosaurus. The dinosaur probably left the footprint as it walked the shoreline of an ancient shallow sea that once immersed Texas, Adams said. The track was described and named in 1935 as Eubrontes (?) glenrosensis. Tracks are named separately from the dinosaur thought to have made them, he explained. “Since we can’t say with absolute certainty they were made by a specific dinosaur, footprints are considered unique fossils and given their own scientific name,” Adams said. The fossilized footprint, preserved in limestone, was dug up in the 1930s from the bed of the Paluxy River in north central Texas about an hour’s drive southwest of Dallas. In 1933 it was put on prominent permanent display in Glen Rose, Texas, embedded in the stone base of a community bandstand on the courthouse square. The footprint already shows visible damage from erosion, and eventually it will be destroyed by gravity and exposure to the elements, Adams said. The 3D model provides a baseline from which to measure future deterioration, he said. Besides Adams and Jacobs, other co-authors on the article are paleontologists Christopher Strganac and Michael J. Polcyn in the Roy M. Huffington Department of Earth Sciences at SMU. The joy of science: SMU professors from multiple schools and disciplines will participate in a faculty symposium on “The Year of Darwin” 9:30 a.m.-noon Sept. 12 in McCord Auditorium, 306 Dallas Hall. Participants include David Meltzer and Ronald Wetherington, Anthropology, Dedman College; Larry Ruben and John Wise, Biological Sciences, Dedman College; Louis Jacobs, Huffington Department of Earth Sciences, Dedman College; and Rhonda Blair, Theatre, Meadows School of the Arts. Presented by the Office of the Provost, Dedman College, Meadows School of the Arts, and Annette Caldwell Simmons School of Education and Human Development. For more information, contact Pia Vogel, 214-768-1790, or visit the “Darwin’s Evolving Legacy” homepage. Interdisciplinary Dialogue: The interplay between basic social science research and action research will be at the center of “Research on Latino Religious Topics: A Challenge to Scholars,” moderated by Harold Recinos, professor of church and society, Perkins School of Theology; and Hector Rivera, assistant professor, Annette Caldwell Simmons School of Education and Human Development. The event begins Sept. 16 in the Prothro Hall Refectory (Room 104) with a light dinner at 6:30 p.m. and discussion 7-8:30 p.m. Going green: The City of Dallas and more than 20 vendors will present sustainable products and other green solutions as part of SMU’s first Sustainability Fair for students, faculty and staff. The event takes place 10 a.m.-1:30 p.m. Sept. 17 in the Hughes-Trigg Student Center Ballroom. Hors d’oeuvres will be served along with tea and lemonade. Presented by SMU Purchasing. Godbey Lecture Series: Associate Professor of Hispanic American Literature Francisco Morán of Dedman College will discuss “Why Poetry Matters: Playing ‘Ajedrez’ (Chess) with Language” Sept. 17 at Maggiano’s NorthPark Center. The lecture begins at 11 a.m., followed by lunch at noon. The cost is $45 for Godbey members, $65 for non-members. Register online or call 214-768-2532.